The next still will be to create the VIP Guest Pass. Be sure to say it's only visible on Box Office - this way customers cannot see it add it to their carts. You will need to copy the SimpleTix SKU #. 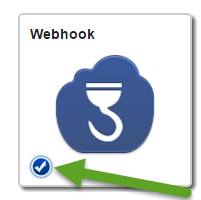 Now let's use the: WebHook URL Template to build your special webhook URL. When the order is complete, we will scan all of the items in the cart. The "trigger" is the specific event that causes the buyer to get the free tickets. TriggerIds - if you entered in section for Category, then put the section's "SimpleTix SKU #" here. Otherwise enter the show's "SimpleTix SKU #" here. In our example it's 100477. Let's specify the free tickets. HowManyFreeTix - how many free tickets?In our example it's 8 free tickets. ComplimentorySectionIds - What is the SimpleTix SKU number for the free tickets? In our example it's 100493. You will now see the check icon that indicates it's active.